ARxIUM offers the FastFind™ Pharmacy Carousel to help increase the overall effectiveness of your pharmacy’s inventory management system. 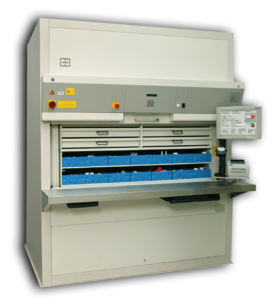 This heavy-duty, automated pharmacy retrieval system is designed to maximize medication storage, improve dispensing speeds, help decrease human error and provide a dependable inventory management solution for pharmacies. The FastFind Carousel uses the pharmacy’s available vertical height to increase the number of stock keeping units (SKUs) stored in the same footprint by up to 60%. The carousel concept allows technicians to retrieve medications from a single location and the ergonomic design minimizes bending and reaching by picking from waist height, saving both time and frustration during the fulfillment process. Driven by the RxWorks platform, the FastFind Carousel employs complete pharmacy inventory management for all items stored in the carousel. That includes the ability to generate purchase orders directly from the carousel when inventory is running low. The redundancy offered by the dual-motor design and high gauge steel frame make the FastFind Carousel the most reliable and durable carousel in its class. For pricing details and more information regarding the FastFind Carousel or any of our pharmacy inventory management solutions, contact ARxIUM today.